Recent advances that allow scientists to quickly and accurately sequence a genome have revolutionized our view of the structure and function of genes as well as our understanding of evolution. A new era of genetics is underway, one that allows us to fully embrace Dobzhansky's famous statement that "Nothing in biology makes sense except in the light of evolution". Genetics: Genes, Genomes, and Evolution presents the fundamental principles of genetics and molecular biology from an evolutionary perspective as informed by genome analysis. 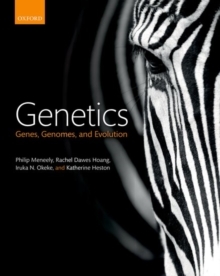 By using what has been learned from the analyses of bacterial and eukaryotic genomes as its basis, the book unites evolution, genomics, and genetics in one narrative approach. Genomic analysis is inherently both molecular and evolutionary, and every chapter is approached from this unified perspective. Similarly, genomic studies have provided a deeper appreciation of the profound relationships between all organisms - something reflected in the book's integrated discussion of bacterial and eukaryotic evolution, genetics and genomics. It is an approach that provides students with a uniquely flexible and contemporary view of genetics, genomics, and evolution. Online Resource Centre:- Video tutorials: a series of videos that provide deeper, step-by-step explanations of a range of topics featured in the text. - Flashcards: electronic flashcards covering the key terms from the text. For registered adopters of the text:- Digital image library: Includes electronic files in PowerPoint format of every illustration, photo, graph and table from the text- Lecture notes: Editable lecture notes in PowerPoint format for each chapter help make preparing lectures faster and easier than ever. Each chapter's presentation includes a succinct outline of key concepts, and incorporates the graphics from the chapter- Library of exam-style questions: a suite of questions from which you can pick potential assignments and exams. - Test bank of multiple-choice questions: a ready-made electronic testing resource that can be customized by lecturers and delivered via their institution's virtual learning environment. - Solutions to all questions featured in the book: solutions written by the authors help make the grading of homework assignments easier. - Journal Clubs: a series of questions that guide your students through the reading and interpretation of a research paper that relates to the subject matter of a given chapter. Each Journal club includes model answers for lecturers. - Instructor's guide: The instructor's guide discusses the educational approach taken by Genetics: Genes, Genomes, and Evolution in more detail, why this approach has been taken, what benefits it offers, and how it can be adopted in your class.